As a part of the activities in Trento made by Informatica Trentina, URBAN INNO has supported the organization of the #HACKDEV17 event in Trento organized by Speck&Tech, an association based in Trento that it is a community of start-uppers, students and young professionals fascinated with technology living in Trentino jointly with the UNITiN, one of the biggest University of Trento’s student association. The #HACKDEV17 was really an unprecedented hackathon, a unique opportunity to experiment in the project, establishing a new scale of community involvement and methods to be used, opening key ICT applications of the country ‘operating system’, developed in early versions by the Digital Transformation Team (a task force in charged by the Italian Prime Minister Office 1 year ago with the aim to speed up dramatically the digitalization level and ICT adoption in the whole country) to contributions and experimental usage by a large community of developers, in 25 Italian cities at the same time, as stated by the Diego Piacentini, head of the Digital Team. 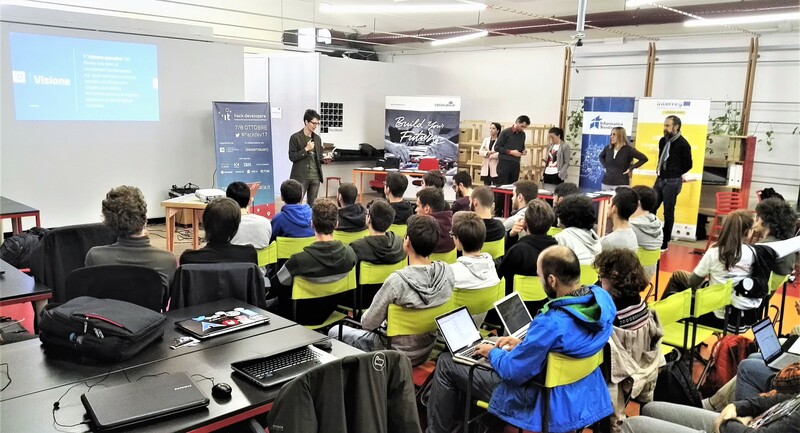 This hackathon - a true marathon of code – was a size challenge never before seen: it is the first time that a hackathon of this vastness was organized in Italy and involves so many cities at the same time. The purpose is that stated: build together a Public Administration to fit citizen needs. The event was organized in collaboration with a specialist in organizing this kind of events, Codemotion, and involved 25 Italian cities plus one foreign headquarters in San Francisco. The nationwide event involved in total more than 80 tech communities and more than 1000 developers. More in detail, the Trento event was of particular interest due the few cities involved in the same geographical area (Italy North East), alone with Venice and Padua over overall territory composed by Trentino, South-Tyrol, Veneto and Friuli Venezia Giulia (more than 8 million population). The Trento event has been a huge success, involving directly in the competition 39 participants, involving more than 60 persons during the two days in the place of the event, plus a newspaper coverage and a quite huge social media activity. Through this action, a very large community of developers (from university, from companies, from civil society) across Italy was called to support the citizen-engagement work already started by developers.italia.it, the open community created in March 2017 by the Digital Transformation Team in collaboration with AgID - Italian Digital Agency. eDrais2017 is a joint project of CyberForum e.V., the European Institute for Energy Research (EIFER), the Karlsruhe Economic Development Department and the EnergieForum Karlsruhe. "eDrais 2017" is funded and supported within the URBAN INNO project (Project no. CE 677), funded by the Interreg CENTRAL EUROPE program, which aims to promote transnational cooperation with regard to common challenges in Central Europe. Find out how URBAN INNO improves urban innovation processes in Karlsuhe and Trento.